Scientists say Earth's atmosphere is about to get hit by some record cold – but it's not because of anything caused by humans. It's because of a lack of sunspots which means a major decrease in ultraviolet waves coming in our direction. Dr. Tony Philipps of SpaceWeatherArchive.com says there have been practically no sunspots in 2018, and that's causing earth's upper atmosphere to cool down and even shrink. He cites some experts from NASA. "We see a cooling trend," says Martin Mlynczak of NASA's Langley Research Center. "High above Earth's surface, near the edge of space, our atmosphere is losing heat energy. If current trends continue, it could soon set a Space Age record for cold." If the trend continues, the NASA scientist says we could see record cold in a matter of months. "The thermosphere always cools off during Solar Minimum. It's one of the most important ways the solar cycle affects our planet," Mlynczak said. NASA's space weather website further explains, "All weather on Earth, from the surface of the planet out into space, begins with the Sun. Space weather and terrestrial weather (the weather we feel at the surface) are influenced by the small changes the Sun undergoes during its solar cycle." 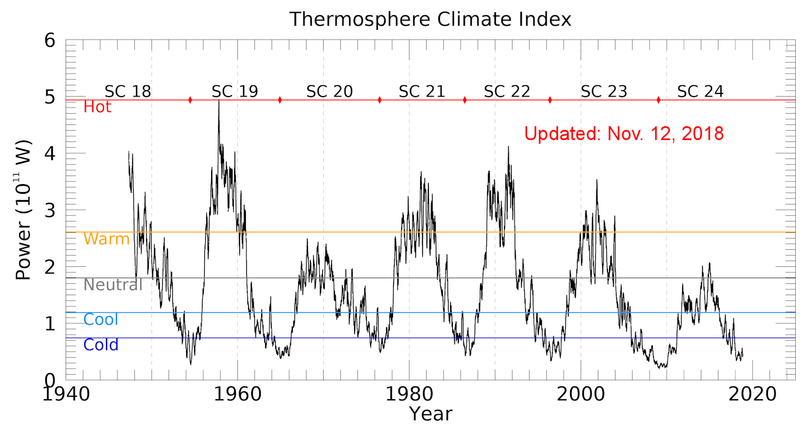 So NASA has created a Thermosphere Climate Index (TCI) described as "a weather metric that tells us how the top of Earth's atmosphere (or 'thermosphere') is responding to solar activity." The TCI shows that, right now, "the top of Earth's atmosphere is approximately 10 times cooler than it was during the record-setting Solar Max of 1957-58." Meanwhile, SpaceWeatherArchive.com also reports that when sunspots decrease, atmospheric radiation actually increases, and that's been happening across the USA. That increased radiation from the sun can be a cancer hazard for airline workers who are exposed to more radiation since they operate at higher altitudes. There's also speculation that this radiation affects heart rate and cardiac arrhythmias on Earth's surface. And the article explains, "Weather and climate may also be affected, with some research linking cosmic rays to the formation of clouds and lightning."